It’s easy to lose sight of your goals in the grind of everyday life. We typically set goals as an emotional reaction to disappointment with where we are now, without considering the logistics of getting things done. And it probably doesn’t help that our biggest cultural push for ambition (the time from Christmas to New Year’s Day) is also our culture’s biggest chunk of time off; a lot of us do most of our goal-setting in an environment far removed from our regular stresses and commitments. Don’t get discouraged. Get smart. You’re probably not sitting on a mountain of free time, and you can’t always rearrange your entire life to grant yourself the time you need for single-minded focus on your goals. Not to mention that well-rounded people usually have targets in several different areas of life, all competing for attention. But if you tinker around enough, you can usually find a little space here or there to squeeze in time chipping away at your obstacles. Struggling to find time for fitness? Dropping just one TV show from your rotation adds an hour a week or more. Trying to write a novel around a full-time schedule? Bring your laptop to the break room. Make your lunch or brew your own coffee, and you’ve got an extra $50 a week for your savings. Take a microscope to your life and you’ll be amazed at what you find. One key step to reaching your goals is to remember that It’s always easy in the beginning, when it feels like a bold new direction. That first longing look at the mountaintop is still fresh in your mind, and you’re probably not even aware of how hard the climb will be. And even when you’re doing it for the right reasons, the good-for-yous from outside observers are bound to put a little wind in your sails. In the middle, though, reality starts to set in. Any ambitious goal is hard enough on its own; you’ve got to fit it into the life you’ve already made for yourself. And when the inevitable setbacks come, and the target is even further away than it was the last time you looked up, the pressure to settle for a lesser accomplishment, or to give up entirely, can feel overwhelming. It’s important, when you start feeling this way, to make sure you remember why you started. Depending on your goal, there are lots of little ways to remind yourself why you’re after it. Drop your clothes off at the thrift store; stop to tell someone it’s because they’re too big now. Take a second look at the mailbox once you’ve emptied it, because that’s what getting out of debt looks like. Post a recruitment flyer from the unit/branch/department/company you’re looking to join somewhere you can see it multiple times per day. In just a few minutes or even seconds, you can get yourself back in that first-day mindset and get back at it with renewed vigor. 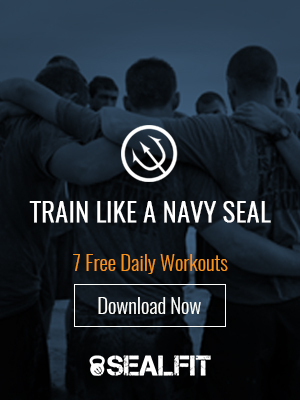 If you’re a SEALFIT kind of person, you go and get. Nothing pleases you like hard work at work worth doing, and you’ve got a laser-like focus on the end goal. There’s a thin line, though, between laser focus and tunnel vision. Your goals are a means to a fulfilling life; working hard to the detriment of your physical, emotional, spiritual or family health destroys the meaning of your accomplishments. And past a certain point, risking illness or injury to keep working jeopardizes your success. So take some time for family and friends. Eat well, but eat good once in awhile. Get enough water, and enough sleep. Laugh. Pray, or meditate, or contemplate. Know the difference between when it hurts and when it hurts. Your shot at the brass ring will come when it’s time.